This colorful, embossed cigar label was printed in the 1920s, when Don Rey cigars were being made in Red Lion PA by T. E. Brooks & Co. (later Van Slyke & Horn). As far as I can determine, the company lasted from 1910 to 2011, when the assets were auctioned off. The brand is now being produced in Puerto Rico (if they survived the hurricane). Hmm. Pillbox hat, red kerchief and lipstick, sideburns. Early gender dysphoria? Posted in Existing photo processed by Bob Lawrence and tagged cigar label, Don Rey Cigar label, Puerto Rico, Red Lion PA, T.E. Brooks & Co., Van Slyke & Horn. Bookmark the permalink. 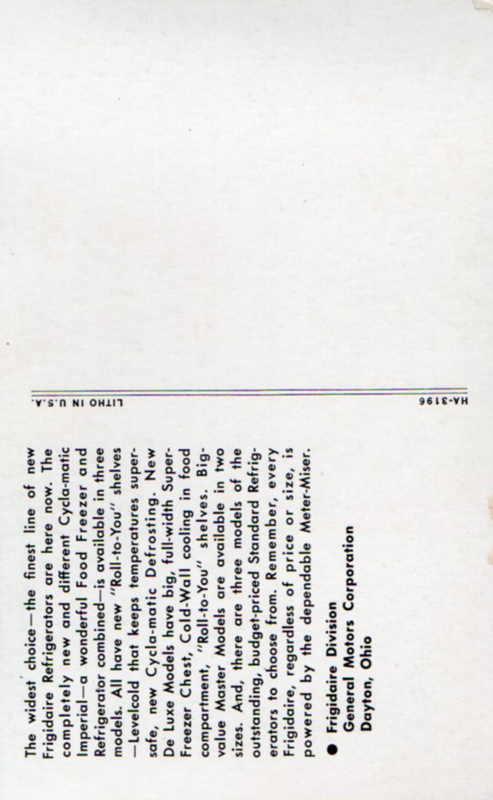 Oversize 5″ x 7″, company-issued postcard. 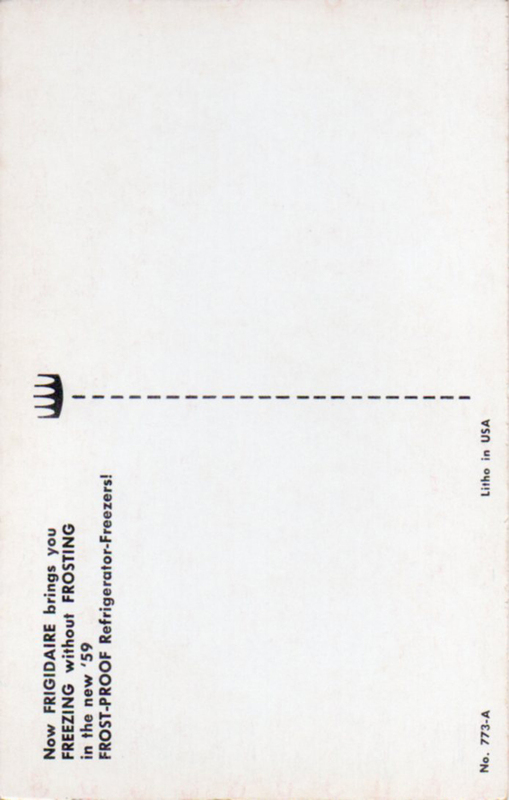 Since Ozark Air Lines acquired its first DC-9s in 1966, I would suppose this card dates from about then. Ozark lasted from 1950 to 1986, when it was bought out by TWA. The company was based in St. Louis. Posted in Existing photo processed by Bob Lawrence, Uncle Bob's Pix and tagged DC-9, Ozark Air Lines, St. Louis MO, TWA. Bookmark the permalink. I put the back of the card first because that’s Meinhardt Raabe as “Little Oscar”. Starting in 1937, he was the original little person (he was 4′ tall) to be the official representative of Oscar Mayer Wieners. This card dates to the 40s. Raabe was in The Wizard of Oz. He was the coroner who pronounced the Wicked Witch as “dead”. Ding, dong, etc. Dextone Made Direct from Kodachrome and Ansco Color by Dexter Press, West Nyack, N.Y.
Posted in Existing photo processed by Bob Lawrence, Uncle Bob's Pix and tagged Ansco Color, Dexter Press, Dextone, Kodachrome, LIttle Oscar, Madison WI, Meinhardt Raabe, Oscar Mayer Wieners, West Nyack NY, Wienermobile, William Wollin Studio, Wizard of Oz. Bookmark the permalink. On the back: PLANT OF WATAUGA POWER ON WATAUGA RIVER NEAR JOHNSON CITY WHICH FURNISHES ELECTRICAL CURRENT FOR INDUSTRIAL, COMMERCIAL AND DOMESTIC PURPOSES TO THIS CITY, THE CITY OF BRISTOL AND SEVERAL SMALLER TOWNS. This is Wilbur Dam. The dam, fully completed and on line in 1912, actually began generating electricity on a test basis to Elizabethton on December 25, 1911, apparently making it the earliest major hydro-electric generating facility in Tennessee. According to Jackie and Dawn Trivette Peters in Images of America – Carter County (page 101), it was named for James Wilbur, a sawmill operator “in the community”. Thanks to Joe Penza, Archivist at the Elizabethton – Carter County Public Library, I found out the whole story and it hinges more on the importance of a railroad name than that of a logging operator. Joe forwarded documents to me that noted the Virginia and Southwestern Railroad Company had established a flag station and side track for the logging operation on Big Laurel Branch. The railroad named it “Wilbur Station”. So, the dam, officially known as “Horseshoe Bend Dam”, took on the name “Wilbur Dam”. When TVA bought the dam in 1945, the name stuck. Dan Crowe, in his book The Horseshoe People (1976/self-published), quotes an Aunt Cass Carden as saying during the dedication of the dam ceremony, “Youngins, they’re a-burnin’ a hairpin in a bottle.” I think she was referring to a light bulb. That suspension bridge in front of the dam was for a time the only access to the powerhouse. Posted in Existing photo processed by Bob Lawrence and tagged Big Laurel Bend, Bristol TN, C.T. American Art Colored, Curt Teich, Elizabethton TN, Hydro-electric plant, Images of America - Carter County, Jackie and Dawn Trivette Peters, James Wilbur, johnson city tn, Virginia and Southwest Railroad Company, Watauga Power Company, Watauga River, Wilbur Dam. Bookmark the permalink. 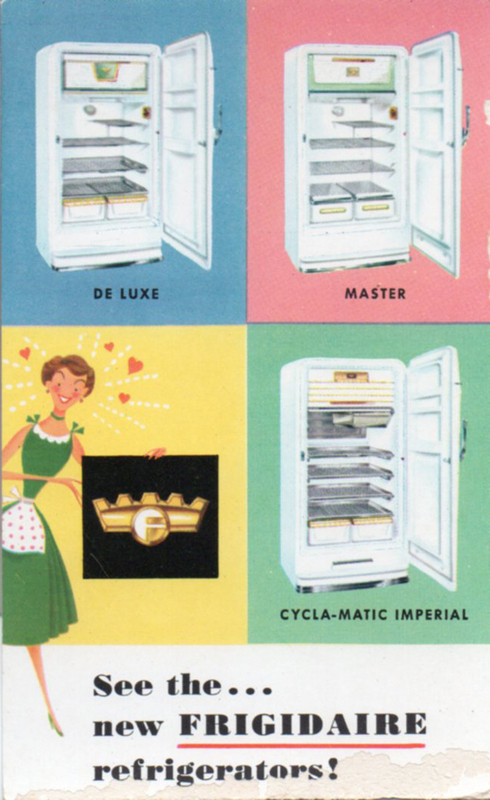 This is a Frigidaire promotional post card from around 1955. 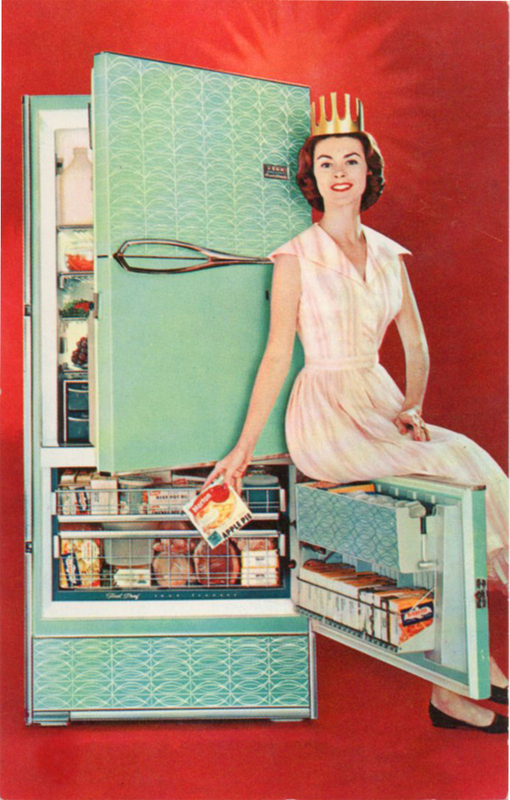 Frigidaire, which began as a brand in 1916, is now owned by Electrolux. The range I bought about six months ago is a Frigidaire. Heats rather than cools, though. This card, with a real model instead of a cartoon character, is from 1959. The new FROST-PROOF model, with the freezer compartment on the bottom, and in the infamous Avocado tone. The two brand names I can determine in this screened image are Birdseye (began as General Seafood Corporation by Clarence Birdseye in 1923) and Morton (began in Louisville in 1940). Since nothing in advertising is spontaneous, I suspect some deals got made. Do not try this pose at home. Posted in Existing photo processed by Bob Lawrence and tagged Birdseye, Electrolux, Frigidaire, Morton Frozen Foods. Bookmark the permalink. As you can see, this portrait was shot at Hodges in Bristol, sometime in the early part of the 20th century. There is no other information anywhere on the picture. It’s just a b&w photographic print mounted on a stiff board, not a carte d’visite. Unless this dude’s carrying a puppy in his coat pocket, he’s awfully wide hipped. He’s also holding up an unfurled umbrella. Is that a code? You can make all sorts of guesses about his expression. Posted in Existing photo processed by Bob Lawrence and tagged Bristol TN, Hodges, photo portrait. Bookmark the permalink.